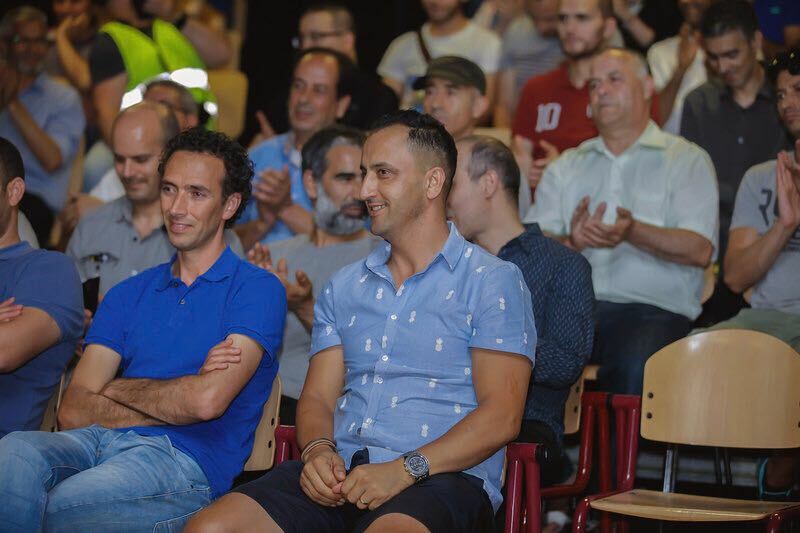 Last Saturday in Rotterdam, on 30 June, a charity event was organized for the second time by Stichting Ontwikkeling Rif (SOR) to raise money for the family’s of the political prisoners of the Hirak movement. Many of the prisoners are breadwinner, what means that their families are now no longer financially able to meet their basic needs. SOR was established shortly after the massive arrests of the Hirak demonstrators to financially assist the abandoned families. After the heavy verdict of Tuesday 26 June, the work of SOR remains important. SOR depends on (permanent) donors to make the work they do possible. Through fundraising activities and other activities they try to raise money and make the public aware of the activities of SOR. The second charity event was of course completely dedicated to the Hirak and the prisoners. It was therefore nice to see that the room was full of involved people. The program was varied for old and young. In the afternoon children could make cupcakes, make-up their faces and put henna tattoos with Amazigh characters on their hands. The evening program, presented entirely bilingual, began with an opening by host and hostess Fatima el Morabit and Hassan Buyatui later replaced by Khadija Al Morabit, the moderator of the evening. Ba Rachid was allowed to take the lead and did it with a smashing performance. The whole room sang along, the atmosphere was great and you could feel the involvement. In between, the audience chanted the same slogans that were shouted during the Hirak demonstrations. This strengthened the connection with the Hirak and the captured demonstrators. It was a strong gesture of solidarity. Then Maartje Jaquet came on who performed three translated poems by Mimoun Essahraoui. Maartje teaches Tamazight and introduces herself in Tarifit before she recites the poems in Dutch. The poems came from the two poem collections of Mimoun Essahraoui. His first collection ‘Smile of a tear’ is still limited available and on his Youtube channel Mimoun presents 10 of his poems. The second collection ‘I will hang your sad dreams’ will be released early 2019 and will be provided with a Dutch translation. Maartje is one of the translators. The poetry book will be for sale at the small price of €10. Follow Mimoun Essahraoui on Facebook to keep up to date with news about his new bundle. Ahmed Essadki arrives on stage and starts with a greeting for all prisoners in Morocco. A greeting from the heart. ‘Yemmas n Bounassar’ (mother of Nasser) is an ode to all mothers of the political prisoners. This moving poem is transmitted by Ahmed with strength and love. All mobile phones are held up to record this presentation. This poem symbolizes the core of the evening. Then it’s time for a break. The visitors can get something to eat and buy various memorabilia and other items, the financial yield will also go to the foundation. After the break Ibtissam Akarkach is interviewed about the book “Revolt in the Rif”. The book is a composite collection of various majority of female writers. It arises from the need and necessity to record experiences with social struggles at the moment. This has always been done too little in Riffian history. The content consists of subjects presented by Hirak demonstrators in Morocco and meanwhile providing information and context among Moroccans in the diaspora. The role of women has a prominent in the Hirak and so also in the book, both in terms of content and the number of female writers of the book. Women have always had an important role during social struggle, but these were mostly underexposed. In order to emphasize the importance of the female role, Ibtissam presents a copy of the book to Najat ‘Tarifect’ for her prominent contribution during demonstrations in the Netherlands. Then it is finally time for the auction. The auctioneers are Boujamaa Maghnouji and Najat ‘Tarifect’. They lead the auction bilingual and via a live connection there is the possibility for people who can’t physically be present to make an offer. The offered items are very diverse but mainly dedicated to the Hirak. There are pictures of the demonstrations, paintings of Abdelkarim el Khattabi, Nasser Zafzafi and other protest leaders. Moroccan style party dresses are auctioned, hats and books. But the showpiece of the auction is the walking stick and the basket (with contents) of 3izi Hmed (uncle Hmed), the oldest political prisoner. He is fortunately no longer behind bars. He has filled his basket with various small items of food, with a personal letter and his cell phone where he left a message. The video is played and received with loud clapping. An offer of € 1500 for the walking stick with basket was made online, but the public decided that they could do better. Together they offered € 1750 and decided to leave the items at SOR in custody as an heirloom of cultural history.